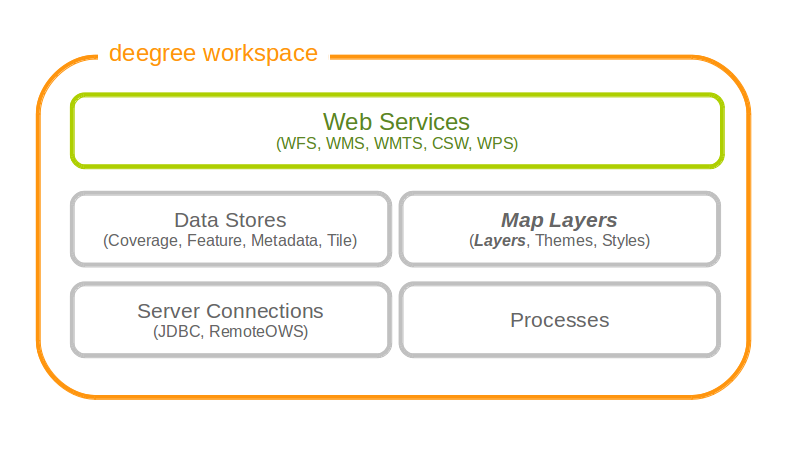 A (map) layer defines how to combine a data store and a style resource into a map. Each layer resource can be used to define one or more layers. The layers can be used in theme definitions, and depend on various data source and style resources. This chapter assumes you’ve already configured a data source and a style for your layer (although a style is not strictly needed; some layer types can do without, and others can render in a default style when none is given). Most layer configurations follow a similar structure. That’s why some of the common components are exactly the same across configurations (they’re even in common namespaces). In this section these common elements are described first, the subsequent chapters describe the different layer types. The description section is used to describe textual metadata which occurs in almost all objects. This includes elements such as title, abstract and so on. The format which is being described here is capable of multilingualism, but processing multilingual strings is not supported yet (you can still define it, though). All elements support the lang attribute to specify the language, and all elements may occur multiple times (including the Keywords element). As you can see, the envelope is specified in a specific CRS. If the attribute is omitted, EPSG:4326 is assumed. The CRS element may include multiple codes, separated by whitespace. This sections describes a set of common layer options. Not all options make sense for all layers, but most of them do. The MetadataSetId is used in the WMS to export a MetadataURL based on a template. Please refer to the WMS configuration for details on how to configure this. The ScaleDenominators element has min and max attributes which define the constraints in WMS 1.3.0 scale denominators (based on 0.28mm pixel size). Please note that for feature layers, the Source element content must be a qualified property name. To understand how the omission or specification of the various optional elements here affect the WMS protocol behaviour, it is recommended to read up on the WMS 1.3.0 specification. The deegree WMS is going to behave according to what the spec says it must do (what to do in case a default value is available or not etc.). The format for the values and the extent is also identical to that used for requests/in the spec. The StyleName specifies the name under which the style will be known in the WMS. The LayerNameRef and StyleNameRef are used to extract the style from the style store. Feature layers are layers based on a feature store. You can have multiple layers defined in a feature layers configuration, each based on feature types from the same feature store. You have two choices to configure feature layers. One option is to try to have deegree figure out what layers to configure by itself, the other is to manually define all the layers you want. Having deegree do the configuration automatically has the obvious advantage that the configuration is minimal, with the disadvantage of lacking flexibility. This will create one layer for each (concrete) feature type in the feature store. If no style stores are configured, the default style will be used for all layers. If style stores are configured, matching styles will be automatically used if available. So if you have a feature type with (local) name Autos, deegree will check all configured style stores for styles identified by layer name Autos and use them, if available. The name Autos will be used as name and title as appropriate, and spatial metadata will be used as available from the feature store. As you can see, the first thing to do is to bind the configuration to a feature store. After that, you can define one or more feature layers. The attribute reverseFeatureInfo is false by default. If set to true, the feature that is drawn first will appear last in a GetFeatureInfo feature collection. After that the standard options follow, as outlined in the common section. Tile layers are based on tile data sets. You can configure an unlimited number of tile layers each based on several different tile data sets within one configuration file. As you might have guessed, most of the common parameters are ignored for this layer type. Most notably, the style and dimension configuration is ignored. Just repeat the TileLayer element once for each layer you wish to configure. Please note that each tile data set needs to be configured with a unique tile matrix set within one layer. It is currently not possible (let’s say it’s not advisable) to configure two tile data sets based on the same tile matrix set within one layer, even if their actual data does not overlap. If used in a WMTS, the WMTS capabilities will contain only the actually used tile matrix sets, and will contain appropriate links in the layers which have been configured with fitting tile data sets. Coverage layers are based on coverages out of coverage stores. Similar to feature layers, you can choose between an automatic layer setup and a manual configuration. In theory this would add one layer for each coverage in the coverage store, but since only one coverage is supported per coverage store at the moment, only one layer will be the result. If a style store is specified, all styles matching the layer name (the coverage store id) will be available for the layer. Within the CoverageLayer element you can only define the common layer options. While only one coverage is supported per coverage store, it might still be desirable to define multiple layers based on the store, for example one layer per style. Remote WMS layers are based on layers requested from another WMS on the network. In its simplest mode, the remote WMS layer store will provide all layers that the other WMS offers, but you can pick out and restrict the configuration to single layers if you want. The common style and dimension options are not used in this layer configuration. In many cases that’s already sufficient, but if you wish to control the way the requests are being sent, you can specify the RequestOptions. If you want to limit/restrict the layers, you can specify any amount of Layer elements. The DefaultCRS element can be used to specify the CRS to request. If the useAlways attribute is true, maps are always requested in this format, and transformed if necessary. If set to false (the default), the requested CRS will be requested from the remote service if available. If a requested CRS is not available from the remote service, the value of this option is used, and the resulting image transformed. This means that all maps are requested with a background color of green, unless the request overrides it. GetFeatureInfo requests will also have the BGCOLOR parameter set, although it makes no difference there. In this case all requests will have USERNAME and PASSWORD set to these values. Users can still override these values in requests. Now all GetMap requests will have the USERNAME and PASSWORD parameters hard coded to the configured values, with the BGCOLOR parameter set to green by default, but with the possibility of override by the user. GetFeatureInfo requests will only have the USERNAME and PASSWORD parameters fixed to the configured values. Please note that once you specify one layer, you’ll need to specify each layer you want to make available. If you want all layers to be available, don’t specify a Layer element. Of course, you can specify as many Layer elements as you like.